With so many paper textures to choose from, our pebble paper is certainly the most popular for both invitations and reception stationery. In the Coastal Chic range we offer Champagne or Aqua and you can also request another colour. “What other colours do you have?” I hear you ask. Well there are around 30 different colours to choose from. 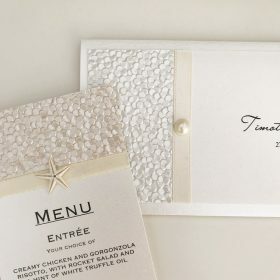 Of course you don’t have to purchase Coastal Chic or Fine Romance to get your hands on this beautiful stock, we offer custom designed invitations at no extra cost. Let us know your ideas today! This entry was posted in Something Fabulous and tagged #weddinginvitations, #weddinginvitationwording, #weddingstationery, colour ideas for weddings, reception stationery, Wedding Invitations, wedding stationery, Weddings.